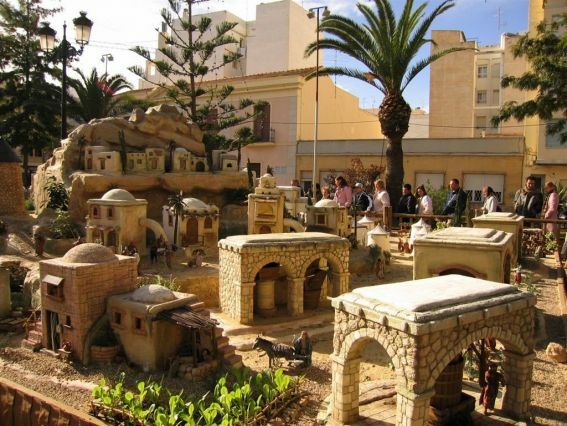 The mayor of Orihuela, Emilio Bascuñana, and the Councilor for Festivals Mariola Rocamora recently presented to the public this year´s Nativity scene which contains more than 300 figures. This Nativity scene has been manufactured by the Association of Nativity Scene Makers of Elche and is installed inside the Episcopal Palace, right in the historic heart of the city of Orihuela. As the mayor explained, the Nativity scene is divided into three spaces: one representing the angel's announcement to Mary, the visit to Saint Elizabeth and the search for shelter; the second one represents the birth of Jesus and the worship of the Three Kings. The third part portrays the Annunciation to the shepherds, the flight to Egypt and the workshop of Nazareth.